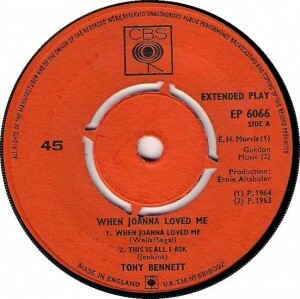 “When Joanna Love Me” is one of Tony Bennett’s more popular songs. When he sings it in concert, he introduces the song by saying “I love this song so much that I named my first daughter after it.” It’s a lovely ballad. “When Joanna Loved Me” was recorded on September 17, 1963 and released in 1964 on the album The Many Moods of Tony. It was arranged by Marty Manning. “When Joanna Loved Me” was recorded and televised live on April 12, 1994 on MTV. The MTV Unplugged album was released in June of that year. The songs from the televised concert were arranged by Tony Bennett and the Ralph Sharon Trio.